The BPA free ice pop molds I have are discontinued. The next closest thing I can find is the Nuby Garden Fresh Fruitsicle Frozen Pop Tray . I like these Popsicle molds better because they come with a tray so the molds don't flop all over the freezer. I can color code the Popsicle so I know which ones are for grown ups only. I tried and failed throughout the summer to get the perfect combination of juice and alcohol that will properly freeze. I finally came up with a recipe that doesn’t have as much alcohol in it as a traditional mixed drink but it will freeze into a Popsicle and not melt immediately when removed from the Popsicle mold. I know it’s there and sometimes that’s all that matters when you’re treating yourself and girlfriends with a covert frozen adult beverage. 1. Mix the cranberry juice, lime juice, and vodka together in a bowl or large measuring cup. 2. 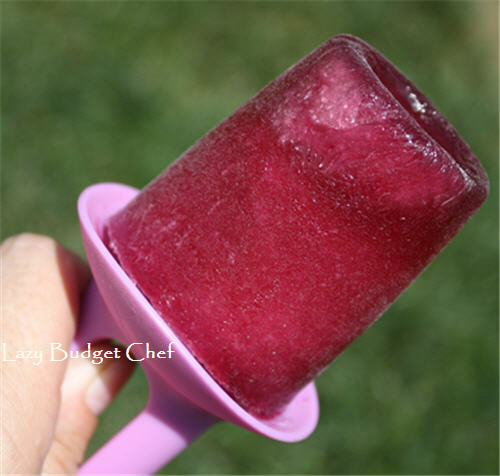 Pour the cranberry mixture into a Popsicle mold. 3. Put the Popsicle molds in the freezer and wait and wait and wait until the cranberry vodka Popsicles freeze solid. 4. Once the Popsicles freeze completely, remove from the mold and enjoy! Vodka is one of those alcohols that melt easily. Wine might work a little better with it. Cranberry vodka popsicles sound tasty. This sounds soooo good! Yum! I love my vodka drinks, so I can't wait to try this!! This recipe will freeze because of the small amount of vodka I use in it. I experimented to make sure I got the right amount of vodka vs. juice so the Popsicles will freeze. Sneaky. I like it! And yes, sometimes the discreet adult beverage is as much for the naughty factor as it is for getting loaded.